Junk Cars, Trucks & Vans. We buy them all. Free towing is offered with every junk auto disposal service. Recycle your vehicle with ease and simplicity. Read about or services below and get a better understanding of achieving the most cash for cars in Central Florida. are streamlined and we are currently available to pick up your scrap vehicle 7 days a week. We purchase any vehicles regardless of year, make, model or condition. Cash for older vehicles, wrecked trucks and scrap vans. Use our junkyard car recycling service for free abandoned or auto removal and rid yourself of old vehicles on your property. Trust only the best cash for scrap auto buyers when junking your vehicle for cash in Central FL. Sell your used auto with Automatic Car Removal Junkyard. When you schedule your vehicle extraction, we are able to pick up your scrap or salvage autos within 1 to 2 hours from the time of your call. We buy wrecked cars and we remove them for free at no cost to you. Automatic Junk Car Removal will dispose of your recycled vehicles with environmental friendliness as our priority. Junking a vehicle for fast cash is easier than some might presume. Checkout our new junk car removal Blog and read about Orlando cash for used cars, trucks, vans & more. Scrap Auto Removal Junkyard is buying your burned cars, wrecked cars, crashed cars, used cars, unwanted and obsolete junk cars, trucks and vans. 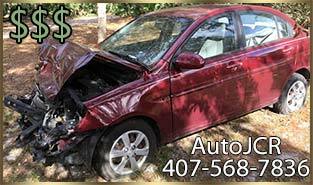 We buy junk cars in Orlando, Daytona, Kissimmee, Sanford, Port Orange, New Smyrna, Lakeland, Ocoee, Oviedo, Tampa and more! We offer free towing services and we pay more cash for old vehicles than the rest of the competition. We recycle used cars, and help people that want more cash for junk auto removal. When you are looking for fast cash for cars with professional assistance, do not hesitate to call us at 407-568-7836. Discover which auto salvage yard you would like to sell your car with. Most other auto removal companies pay with a check or money order. When you use our services, you know for sure that you will receive pure cash on hand and there's no check cashing fees or waiting in line at the bank or waiting until Monday for the bank to open. Free yourself from your junk vehicle, truck or van. Sell your old or damaged auto with the best scrapyard in the business, and get yourself a piece of this Junk My Car Vehicle Removal Service in Central Florida. We are open seven days a week for & are open late to buy junk cars at your convenience. We buy old cars, old & rusty trucks and junk automobiles, we come to you to pick up your wrecked cars. First class professional local junkyard recycling services. We are interested in purchasing your used vehicles. Call 407-568-7836 for additional information. Please call with any questions or concerns about our salvage or junk vehicle removal & recycling services. We are glad to help you resolve your automotive uncertainties. Polk County: Polk City, Haines City, Lakeland, Mulberry, Auburndale, Winter Haven, Davenport, and Bartow.